“Everything is energy, and that is all there is to it,” said Albert Einstein. Pondering the unseen with the world’s most famous scientist gives us a glimpse into understanding ‘Watts” fueling and shaping our human experience. Like all energy, just because you cannot see it does not mean it is not there and does not affect us. The ancient Chinese, Japanese and Indian cultures referee to it as chi, qi, prana and shakti. Many of these ancient civilizations use the concept of chakra’s, or inner energetic grids as a roadmap for exploring how the current of energy is received, assimilated and expressed through our lives. Seven major chakra’s or energetic grids are needed to match the wattage requirements of each of the seven elements of the universe. Each element of the universe vibrates into expression as a result of different energetic frequencies. For example; the first chakra’s element is earth which calibrates at a very different frequency than the element of fire of the 3rd chakra. Also, the element of air of the 4th chakra is a very different frequency than the element of light of the 6th chakra. The element of the seventh charka is conciseness which requires the spinning wheel to move at its fastest speed to express this element. Einstein’s also said “match the frequency of the reality you want, and you cannot help but get that reality. It can be no other way! This is not philosophy; this is physics”. This theory also plays a roll with balancing each of the chakras (energy girds) By matching the energetic frequency of the specific element through attention, colour, intention, sounds, crystal/gemstone, scents, physical function, and the food we eat. You cannot help but match that reality in-turn balancing and healing our physical, mental, emotional and spiritual lives. When we think of safeguarding our physical wellbeing we often first consider the health of soft tissues and organs and spend less thought on nourishing the frame. The skeletal system performs vital functions such as support, movement, protection, blood cell production, calcium storage, and endocrine regulation that enable us to survive. The frame or skeleton is made up 270 bones at birth and decreases to around 206 by adulthood after some fuse together. Around the age of 21, we reach our peak for building bone mass; from there the density and mass start to decline as one age. Bones become more brittle and break more easily. Osteoporosis (from the Greek “porous bone”) is known as the silent disease because the loss of bone density is not readily perceptible. This is a common problem, more so for older women after menopause. Also, the health of the frame is dependent on the health of the joints. As we age joints health breakdowns decrease mobility leading to inflammation, pain, stiffness affecting posture and movement. Exercise along with a healthy well-balanced diet are some of the best ways to slow or prevent problems with the bones and joints. Yoga offers a safe way of engaging the principles of progressive overloading which means that we place a higher than average demand to build strength in the bones. With a detail for proper alignment of the skeleton, yoga postures such as standing, inversions and balancing poses help to build bone density and mass. Combined, with a joint care practice of yin yoga that is quieter with longer holds to load the joints with new circulation, we can have an ideal practice to safeguard the frame through the declining years. Claude Debussy, the famous French composer, said: “music is the space between the notes.” The concept that what is not there is more important then what is can also be applied to how the symphony of our life is being composed. By giving importance to the space between the intervals that direct our day, allows the moments to resonate, be digested, reflect upon and for life to fully express its self. We all have an individual beat, but sometimes it feels like the tempo is being chosen for us. Yoga helps by giving us the opportunity to play our rightful role as the composer, conductor, and orchestra of owe concert, along with the tools to reset our rhythm by honoring, seeking and spending time in the space between. The breathing aspects of yoga (pranayama) help us reset the pace and quality of our breath which is determined by the space between inhaling and exhaling, the less space, the less breath, the less life force energy. 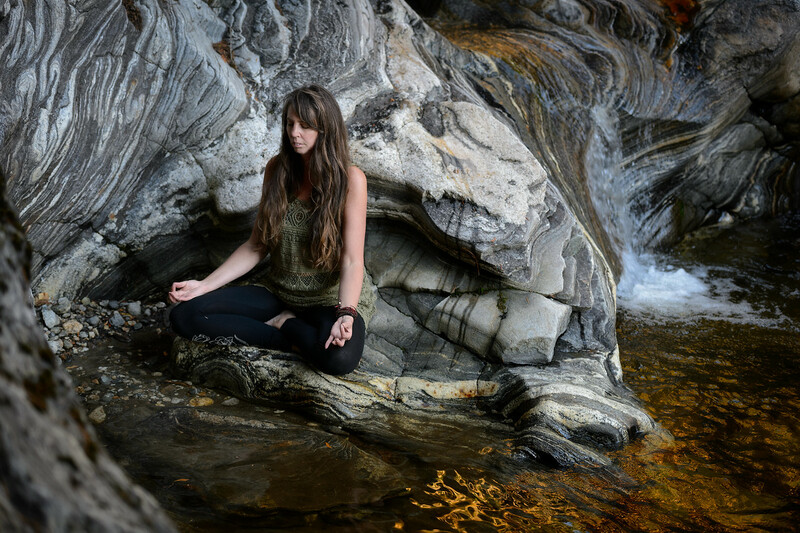 Meditation widens the space between our thoughts offering inner peace, mindfulness and time for soulful reflections. Moreover, the yoga poses (asanas) nourish and creates the spaces between the physical matter in our bodies that is required for health, the less space, the more tension, tightness, toxin accumulation arising as pain and disharmony within the body. Honoring the importance of the space between gives us an antidote against burn out, stress, illness, loss of connections and lack of purpose in life as it heightens, strengthens and illuminates the experiences of life. So this New Year ask where is the tension building in life, and where it is it needed to leave more “space between” to bring my music back into harmony? Everyone ages, not everyone ages well! Healthy ageing starts the moment we are born and becomes even more important the older we become. Ageing is the process of systems deterioration over time. There does not seem to be one single cause of ageing, but multiple contributors such has genes, inflammation, stress adaptation, metabolism, molecular damage, stem cell regeneration, proteostasis, and epigenetics. 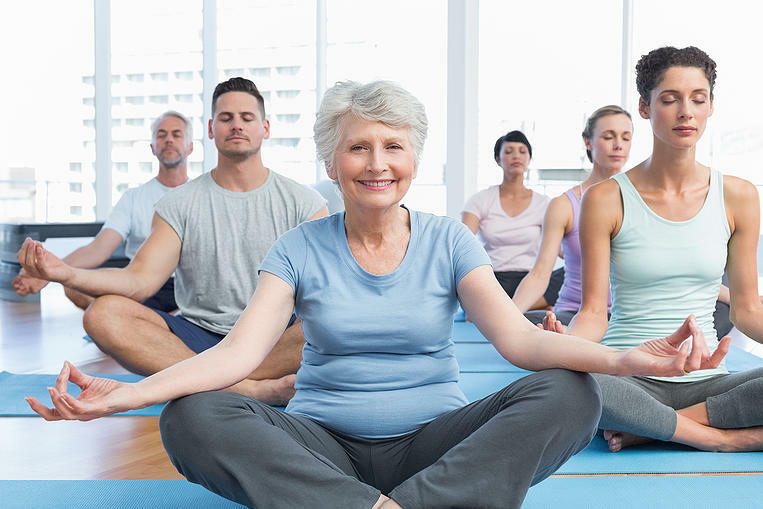 Yoga is one of the leading practices that can help us age well by working with the many levels of self. A cornerstone to ageing well is movement and agility which is made up of three key elements: flexibility, strength, and balance. Yoga postures help to maintain and increase the flexibility of muscles, the range of motion of joints and the elasticity of fascia. Yoga postures build strong bones, a firm core, lower and upper body strength which give the body stability for movement. Strength, flexibility, and balancing provide the body with the ability to move freely thus increasing metabolism and reducing inflammation. Yoga practice also aids in removing impurities in the body stimulating cell regeneration and rebirth of healthy new tissue. Keeping your body moving and doing what you love helps create emotional, social and mental wellbeing. Deep breathing techniques and the practice of meditation and mindfulness helps reduce stress and builds a healthier more focused brain. In return, this quiets the mind and facilitate better sleep and rest. Ageing with spiritual grace can turn fear into purpose and endings into new beginnings by connecting to one’s higher self. What you think about ageing directly affect how you age, so keeping moving and cultivate a positive attitude to enjoy the journey, no matter what chapter of your life you are on. Addiction is an opportunist disease that prays on the vulnerable parts of self. It disconnects one from their power, which inevitably turns up the dial of suffering in one’s life. Sustainable healing first starts by making peace with our inner world, to learn new skills and grow a better version of self that is stronger, healthier and more connected to one’s power. Yoga offers a holistic approach to recovery and emphasizes the importance of a mind-body-spirit connection. Addiction takes a person outside their body, it is the ultimate check out and disconnects. The physical postures of yoga help you to re-inhabit your body and claim the right to live in it. Yoga also heals the negative impressions and scars left in our tissues and energy systems from neglect and abuse. The meditation aspects of yoga offer a path to calm the fluctuations of the mind, to gain focus, mental clarity, and direction. Moreover, to become the master and not the slave of an addicted mind. Your pain is not coming from being broken it is coming from being disconnected. The spiritual aspects of yoga help to heal this separation and reconnect you to the source of your power. So when the opportunist disease of addiction comes knocking on the door of recovery, it will find a version of you that loves, cares and has reclaimed a life of purpose and health thus reducing the chances a relapse. To love oneself is to heal oneself. The Eight Limbs of Yoga explained. If you have a broader interest in yoga has a comprehensive sacred science of mind, body, and spirit it most likely your journey will take you to the doorsteps of the eight limbs of yoga. The Yoga Sutras of Patanjali describe these limbs has an eight folded path to put us into harmony with all existence. The first limb is the Yamas which consist of five universal principles. They reflect the path to an egoless self. The second limb is the Niyamas which are five personal disciplines. The Yamas and Niyamas are often referred to as the ethical teachings of Classical Yoga. Asana, the third limb of yoga means a steady and comfortable posture. When people say yoga, most are thinking about the asanas for which yoga has become famous and for the health benefits of flexibility and strength. Pranayama the fourth limb can best be described as yogic breath and energy work. The word can be divided into two parts; Prana, meaning life force or vital energy, and Yama, meaning extension or expansion. Pratyahara is the 5th limb of yoga which is the bridge between our inner and our worlds. Withdrawing our five senses invites the outer gates of awareness to close and the inner gates to open. The 6th limb is Dharana is to develop our concentration muscles and direct one’s attention where you want it to be. It is then that the yogi enters the 7th limb of Dhyana or meditation which is stopping and moving beyond the rolling thoughts of the mind. The 8th limb Samadhi, which is the accumulation of yogic achievement in Yoga, the state of moksha or awakening. This was the mantra of practice at the 3rd annual Peace in the Park event this summer. The notion that responsibility for peace depends on each of us sounds simple enough but is much more difficult putting into practice. Our own inner battlefields projected outwards gives us a glimpse into how the inner world is creating the outer world. Yoga inspires peace by inviting us to be inwardly interested in this disharmony. To be mindful of our thoughts and the dis-ease of the body, to know where disharmony resides. Awareness is always the first step to lasting change. To transform oneself for the betterment of peace requires a healthy way of interacting with our body, mind, and healing our connection to spirit. The 8 limbs of yoga are a roadmap to sustainable peace and harmony. An understanding that life gets on us and we don’t always get it right, that resisting the way things manifests as physical tension in the body and mental tension in the mind. To return to inner peace is the greatest gift of practice the ancient sages of yoga gave to the modern world. Peace begins with me, a mantra for the practice of life. If you want to live in a peaceful world, then it is up to you to make sure that you are a peaceful person. Together we will help bring peace and loving kindness to our world. Metabolism is the process of how our bodies changes and transform the food you eat into either heat, fuel or substances such as fat, muscle, blood, and bone. At any given moment your metabolism is either burning, storing or building. In Yoga, our 3rd chakra governs this process, and this Manipura energy center houses digestive fires known as Agni. The more you stoke up this fire, the more competent your body will be at processing food. For example, if you are having a campfire and the wood is soggy it is challenging to transform wood into heat. Similarly, if digestive fires are soggy or sluggish is will not burning to full capacity, at that point you are not getting the best use out of the food you eat and maybe storing more of it has fat. Yoga practice helps with three essential S’s to metabolism, strength, stress reduction, and stretching. The healthier the muscle, the faster your metabolism will be. When multiple muscle groups work in conjunction, the tissue starts to increase in size and density increasing the Agni. 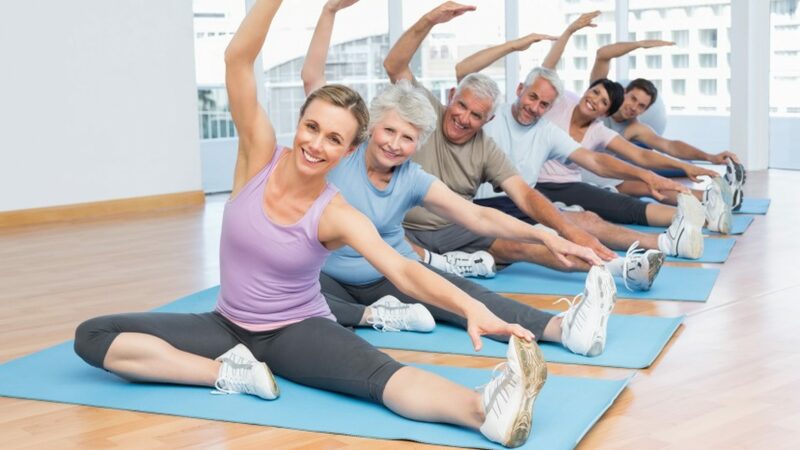 Stretching improves circulation and brings oxygen to the tissues. Many yoga postures help with digestion and elimination and the more we stoke up the digestive fire, the stronger our metabolism. Yoga also calms the mind and is an effective way of reducing stress. It also helps us make peace with our body and the food used to nourish ourselves. Some other vital elements to stoking up the digestive fire and increasing metabolism are to eat within 30 min of awakening, keep the fire stocked with healthy snacks between meals, and stay away from fake processed food. Getting a good night sleep is an important ingredient in any wellness program. The 4thlimb of yoga, pranayama can but our practice can also be a prepare us for deep rest. there are numerous practices within yoga which can really assist with a good night’s sleep by practicing breathing or pranayama special techniques can make a good night’s sleep can be within your reach. There is a yogic concept that suggests that breathing through our right nostril is associated with solar energy, vigour, and alertness; while left nostril breathing is connected to moon energy, calmness, and sensitivity. A simple technique to increasing Lunar Energy is to block the right nostril with the right thumb and take 26 long, deep breaths through the left nostril. If you feel that your mind is still active with concerns from your day it may have turned up the volume of the sympathetic nervous system (fight or flight) your heart rate and your breathing speed up, and stress hormones like cortisol start pumping through your bloodstream, preparing your body to face a threat making sleep even more difficult. A simple second great, simple breathing tip for calming both the nervous system and the overworked mind is a timed breath where the exhale is longer than the inhale. When your exhale is longer than your inhale, the vagus nerve (running from the neck down through the diaphragm) sends a signal to your brain to turn up your parasympathetic nervous system and turn down your sympathetic nervous system. Putting your body in a parasympathetic state is easy. Pick a count for your inhale and make the count for your exhale 2 times as long. For example, if you breathe into the count of 4 try exhaling to the count of 8. When the parasympathetic system is dominant, your breathing slows, your heart rate drops, your blood pressure lowers as the blood vessels relax, and your body is put into a state of calm and healing which will take us deeper into sleep. The chakra system is a seven levelled philosophical model of the universe. It is a center that receives, assimilates and expresses life force energy. The word chakra translates as “wheel or disk” and refers to a spinning sphere. There are seven main chakras stacked in a column of energy that spans from the base of the spine to the top of the heard. This chakra system is a bridge between polarities, heaven/earth, inner/outer, above/ below, matter/consciousness. Chakra one is our center of stability and basic needs, located near the base of the spine, element-earth, colour-red. Chakra two is our center of creativity and sexuality, located in the pelvic area, element-water, colour-orange. Chakra three is our center of power, located in the navel area, element-fire, color-yellow. Chakra four it the center of love it is situated in the heart area, element-air, color-green. Chakra five is our center of expression, located in the throat area, element-ether, color-blue. The last two chakras connect us beyond this earthly realm, chakra six is our center of intuition, located at the eyebrow center point (third eye), light-element, color-indigo. Chakra seven is the center of our spiritual connection it is situated at the crown of the head, cosmic energy-element, color-violet/white. For optimum health harness the power of the chakras through yoga practice, chakra meditations, essential oils, crystals, affirmations, and color vibration. How you move, defines how you live. Humans are often short-sighted when it comes to assessing the risks and benefits of their lifestyle choices. How you move is inevitably how you live. We have the power to shape the lifestyle we want through the movement and health of our bodies. Sitting is the new smoking, and movement is the new regenerative medicine that restores, repairs strengthen and creates the flexibility and stability we need to be mobile. From the time we are born our bodies crave movement in many directions, up/down, bending\extending, forward, back, side and twisting. We naturally lose lean muscle mass and range of motion as part of the ageing process. Here are six ways yoga helps you move better in your life. One of the critical functions of yoga postures is to get us ‘unstuck’. Yoga postures like lunge, pigeon and bound help to loosen your hips. And for upper body mobility yoga postures like cobra, upward facing dog, extended side angle and twisting postures invites movement of the spine and shoulder girdle. Don’t make the mistake of thinking that yoga is a passive exercise; it builds strength and agility in areas that other exercise programs don’t come near. There is an incredible amount of medicine in the movement of our bodies. Remember! We get good at what we practice. So practice healthy choices that bring a longer, more vibrant and full lifestyle from youth to old age. Let’s face it, balance can be tricky, but exercising equilibrium can help to restore evenness in our footing and lives. Balance often has more to do with your mental state than your physical abilities. If you’re stressed or if your mind is scattered, your body is likely to be unsteady. Vrksasana (tree pose) can help, it is one of the grandfathers of Hatha yoga balancing postures. This ancient asana can be found in Indian relics dating back to the 2nd century. Since it is relatively simple and strengths your spine, ankles, calves, and legs, it also opens your hips and thighs, and tones the abdominal muscles. When you practice balance, you will learn some practical lessons in how to find your roots, stay centred, steady your mind and be focused. Plus, the process of wobbling and trying again and helps develop patience, humility, persistence, and a good laugh. There is help, three tools you can use to quiet the mental chatter and steady your mind and body. First, be aware of your breath. Paying attention to your breathing helps to unite body and mind and establishes a state of mentally calm. Second, direct your gaze, also called drishti. A steady gaze helps focus your mind. Third, visualize your roots, imagine that you are a tree, with your feet planted firmly in the earth and your head extending up towards the sun. What balance teaches us is to ground ourselves into the present moment, to live from our center and to find the calm within our bodies and minds. People come to meditation for various reasons. Some arrive because they have stress-related illnesses, depression, anxiety, or struggling with addictions, while others are seeking meaning and purpose in their lives. When we first enter the practice of meditation we realize that our inner world is in need of healing. Often our minds are hanging out in a bad neighbourhood causing us to suffer mentally, physically, emotionally and spiritually. Meditation is the seventh limb of yoga, the preceding six limbs preparing the body, breath, and attention to draw awareness inward. In its most basic form meditation is a method or technique that trains our attention to focus on an object conducive to inner peace. In a recent neuroscience study, humans have lost to the concentration ability of a goldfish. A goldfish can concentrate for 9 seconds; humans have fallen to 8 seconds. Highlighting the effects of an increasing digitalized lifestyle on the brain. Meditation can help to heal the parts of our minds that are “broken” or otherwise dysfunctional. Meditation helps to ease unrelenting mental busyness, obsessive distractions and negative thinking patterns such has resentment that sabotage one’s happiness. Meditation as a spiritual path helps us to answer two significant questions. Who am I, and what is my purpose. Getting in touch with our most profound sense of self, leading us to the place of awakening and enlightenment. There is power in where we place our attention; meditation gives us the tools that help one focus that power towards inner peace, health, happiness and a life of purpose and connection. It’s a shame our troubles don’t stay behind with our shoes when we step into the yoga studio. We often get to our mats feeling overpowered with our life’s problems or in need of an energy lift. Might you credit your new found feelings of clarity, lightness, and vitality to the physical movement of your body? Maybe, but the ancient yogis and many teachers today would also attribute this feeling of wellness to the unique way that yoga poses and breath work move blocked prana (life force energy) through the chakras. When muscles have knots, sensation show up has aches and stiffness, the same is true for energy. Granthis is a Sanskrit word for KNOT and refers to places in your chakra’s where you are not, places where you will not or cannot go inside yourself due to traumas and abuses. For example, the job of the first chakra is to receive, assimilate and transmit life force energy that grounds us into our physical form. Plugs us into our right to be here, to feel safe and steadfast in one’s skin. If the first chakra experiences “granthis” (knots) the flow of energy is affected and one might feel symptoms of not being grounded, loneliness, insecurity, depression, anxiety, addictions and many other physical symptoms of aches and pains. A flowing first charka allows negative emotions to be released, regenerating confidence and your will to move forward in life. A balanced root chakra also generates the flow of energy to all other charkas (seven major and other minor chakras) Start by thinking of your chakras as a blueprint for good self-care, and your yoga practice as the architect that makes that design a reality. In the past 70 years, yoga has gone from a little-known, esoteric Indian practice to a central activity in cultural mainstream. But while it is commonly available in our city and throughout the world, yoga still remains something of a mystery to people who have never tried it. That’s because it resists an easy definition. Yoga is a diverse and diffuse practice with numerous threads that can be interwoven in many ways. The word yoga comes from Sanskrit—an ancient Indian language. It is a derivation of the word yuj, which means to yoke meaning union. Union of what you might ask, union of the mind, body and spirit. It’s a practice that helps us inhabit our humanness with greater, ease, respect, awareness and love. The anatomy of our humanness at its very core is a series of relationships. For example, the mind is having a relationship with the body, the systems of our body are having a relationship with each other and all are having a relationship with spirit (energy life force within). Yoga at its foundation is about creating balance and harmony within the relationships visa physical postures (asana) breathing (pranayama) and meditation (dhara) and much more. Who Can Do Yoga? EveryBODY! Forget any stereotype you might have of what a “yoga person” looks like because anyone can do yoga. That includes men, seniors, children, pregnant women, people with bigger bodies, people with arthritis, non flexible people and so on. Start with the flexibility of your body, delve a little deeper into the flexibility of your mind and end with good health, inner peace, purpose and harmony in your life. Summer brings such relaxation, such fun, and such possibilities. The best part about nature is that it will return. So I say goodbye to summer and hello to fall, roll up my summer gear and roll out my fall routine. One of the routines I love the most is returning to the yoga studio and sharing the gifts of yoga with students. Entering the sacred space of practice, I take a moment to reflect on what draws me back to the practice of yoga over the past 22 years. Maybe it’s how yoga invites inner awareness, to reconnect me with my breath and body, it’s a reunion with an old familiar friend that says, “hello, there you are”! To be steeped in ancient yogic formulas of nourishment for my mind, body, and spirit. How could yogi’s 5000 years ago know so much about what is needed to return to wholeness, and for it is even more relevant today? The answer lies in the ancient texts of The Yoga Sutras of Patanjali. These threads (sutra’s) show us the road out of suffering and a pathway into awakening. Patanjali explains the formula towards liberation and freedom through 8 stages. These 8 stages or limbs are as follows: Yama’s, 5 moral codes (non-violence, truth, non-stealing, continence, non-hoarding ), Niyamas, 5 self-disciplines (cleanliness, appreciation, self-discovery, tapas, surrender), Asana (physical postures, seat), Pranayama (breath control or regulation), Pratyahara (withdraw of senses, movement from the external world to the internal world) Dharana (concentration, focus the awareness), Dhyana (meditation, constant flow of concentration), Samadhi (absorption, oneness, alignment to source). I then experience ‘YOG-AHHH’ and relax into an extraordinary life of ease, love, joy, connection, and freedom. Namaste to the equine lovers. Whether you ride to compete or simple pleasure your balance and comfort in the saddle can be improved with a yoga practice of simple postures, breathing and mindfulness. According to Namaste Yoga’s equestrian yoga teacher Sam Verbeek, “yoga can help heal and release all parts of our body, it also has the ability to strengthen areas of our riding and fine tune our mental focus. Tight hips and a sore back are very common complaints from riders. You may wonder why you have back pain? The simple answer generally lies within our core. If your core is lacking, your lower back muscles will make up for the lack of muscles which will get you through the necessities your back will suffer because it is doing more than it is designed to do. 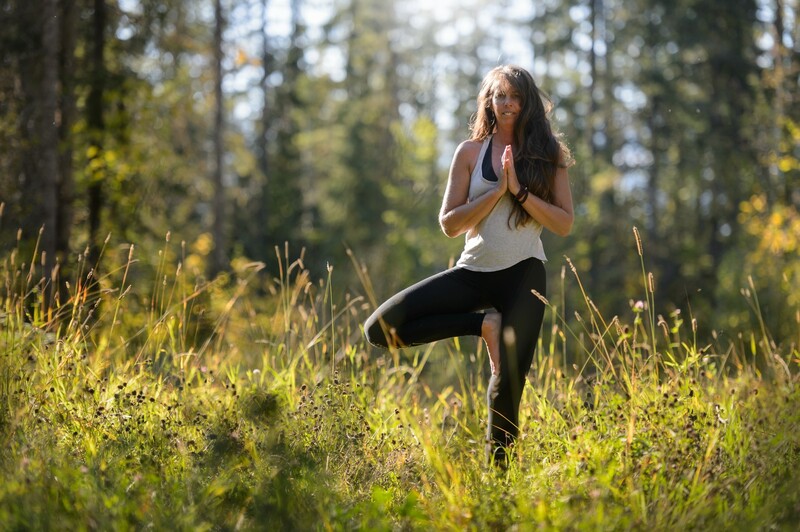 While this is a common ailment, for many people not just equestrians, the good news is yoga can help because many yoga postures help build needed core strength. Horses are prey animal, and the present moment is all they know. Horses pick up on our energy and are a true mirror of our emotional states. When we are balanced in our mind body and spirit, we lead a healthy more fulfilled life, and are more connected with our horses”. It’s about connection, calm interaction, mobility and strength of the rider. Equestrian yoga starts with the rider becoming a worthy equine partner, when we have a healthier relationship within ourselves then the connection with our equine friends will be in alignment. Find your roots and ground yourself into the present moment of being balanced. Vrksasana (tree pose), the grandfather of reliable poses, is often the first balance posture you learn. This ancient asana can be found in Indian relics dating back to the fifth century. Since it is relatively simple and strengths your spine, ankles, calves and legs, it also opens your hips and thighs, and tones the abdominal muscles. When you practice balance, you will learn some efficient lessons on how to find your roots, stay centred, steady your mind and be focused. Plus, the process-falling and trying again – helps develop patience, humility, persistence, and a good laugh. Sometimes it’s just windy in the forest, Lol. Balance often has more to do with your mental state than your physical abilities. If you’re stressed or if your mind is scattered, your body is likely to be unsteady. There is a help, three tools you can use to quiet the mental chatter and steady your mind. 1stbe aware of your breath. Paying attention to your breath helps to unite the body and mind and establishes a state of mentally calm. 2nddirect your gaze, also called drishti. A steady gaze helps focus your mind. 3rdvisualize your roots, imagine that you are a tree, with your feet planted firmly in the earth and your head extending up towards the sun. Then take a moment and enjoy being grounded into this moment. Yes, lose it! The good news is you can find it again. The body’s capacity for recovery is phenomenal. Yoga can be the missing element to reclaim what has been lost and re-gain fulfillment & independence. It is true that active people lead fuller lives. They have more stamina, resist illness, and stay trim. They have more self-confidence, are less depressed and often, even late in life are still working energetically at new projects. Our ancestors did not have the problem that go with a sedentary life: they had to work hard to survive. So what does yoga have to do with all this? A large aspect of the physical asana’s (postures) of yoga is about extending muscles, joints and tendon towards their full ability. To improve the elasticity of muscles and connective tissues such as fascia. The objective is to deliberately flex or extend to the ideal range of motion and function. This would enable the muscles, joints connective tissue to work more effectively thus improving your performance in sports, and other physical activities. 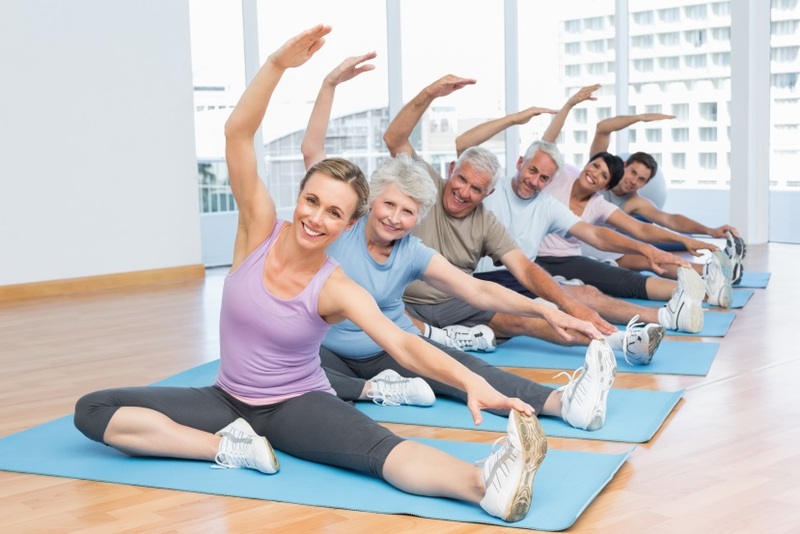 Stretching is the link between sedentary life and the active one. It keeps muscles supple, prepared you for movement, and helps you make the daily transition from inactivity to vigorous activity without strain. Some of the other benefits include increased range of motion, reduces muscle tension which makes the body feel more relaxed, and reduces stress. It also lowers injury and muscle strain, promotes circulation, develops body awareness and helps to remove toxins. Stretching is not stressful. It’s peaceful, relaxing and non-competitive. And it feels GOOD. In 2016 Canada women over the age of 50 totalled 6.9 million which makes up 22% of the population. The average age of menopause has remained stable at age 51 and is defined as the ceasing of menstruation for 12 months. Women seeking relief from menopausal symptoms ranging from negligible to severely problematic and is reported in over 85% of women. Hormone replacement therapy (HRT) was previously seen as the most effective treatment for menopausal symptoms, but the use of HRT declined significantly around the world due to the risks outweighing the benefits. This has lead women to find healthier alternatives to ease hot flashes, night sweats, anxiety, insomnia, depression, memory problems, weight gain, and mood swings. 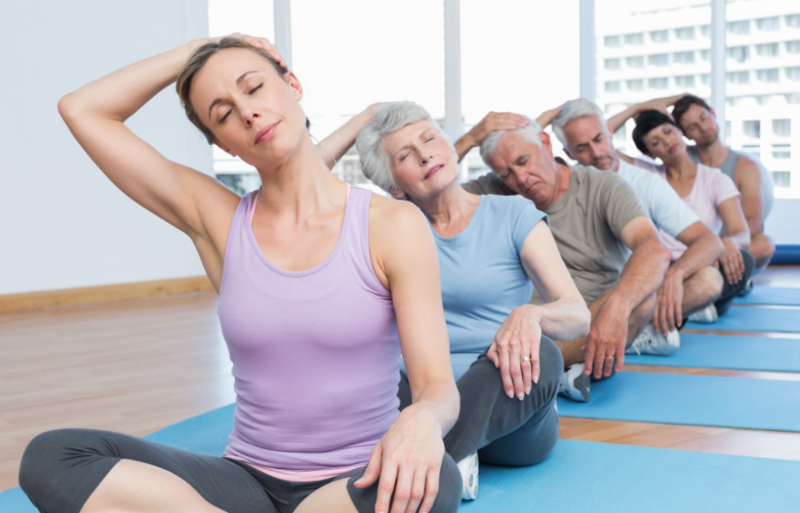 Yoga falls into the top 10 of complementary alternative medical treatments for menopause. For good reasons, first, it is a natural remedy, its low impact, and it’s readily accessible. Typical hatha yoga classes include some form of breath work (pranayama) and relaxation, this combined with physical postures help release the buildup of pitta (heat) energy. Lowering stress levels is key during this transitional time in a woman’s life. Other yoga practices such as meditation, yoga nidra, restorative yoga can also help to clear negative impressions of the mind and body, helping one feel more balanced, grounded, calm and peaceful. The loss of youthful lustre, reproductions abilities can leave one feeling lost and full of questions. Yoga helps by inviting awareness inwards to our true nature, which is unchanged. Its gifts you the opportunity to rediscover your authentic self and purpose in life. To emerge from the chrysalis, spread your wings and fly.